I am a permanent resident of Rapakot-01, Syangja, Gandaki currently leaving in Sinamangal, Kathmandu. I am a mountain loving person, the passion of walking to the unspoiled nature invited me in this profession. I am a licensed trekking guide and have persuaded trekking guide training from Nepal Academy of Tourism and Hotel Management (NATHM) obtaining “A” Grade. 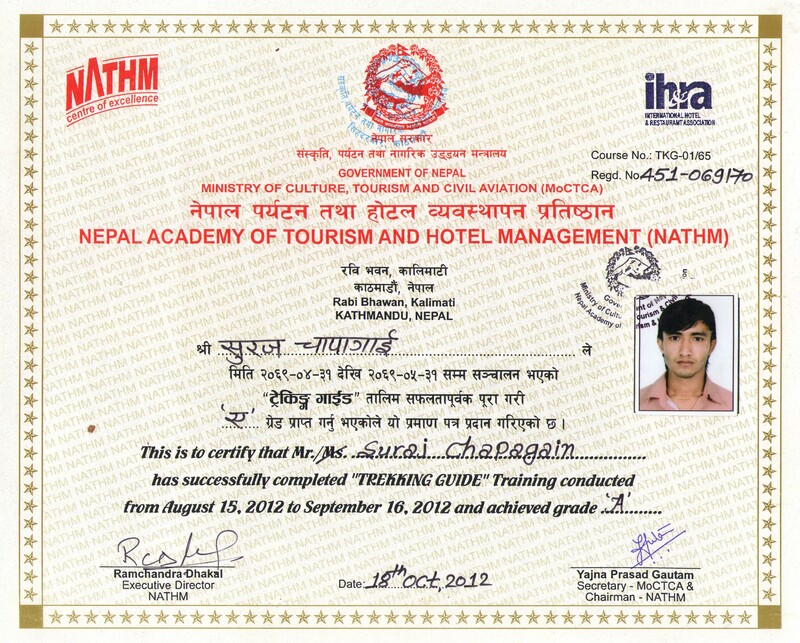 I have obtained the trekking Guide license under the Government of Nepal from the Nepal Tourism Board. My license number is 8113. I have completed my bachelor degree in business management, I speak good English and self-learning foreign language. Around Manaslu Trek.Langtang Valley Trek.Visit Pokhara and Home stay Sirubari. 1. A total of 110 species of birds have been identified in the area. 2. Enchanting view of Manaslu, at 8,163m which is the 8th highest peak in the world. 3. Encounter with variable flora and fauna. Manaslu is newly opened for trekking. and is one of the toughest treks in Nepal, one with sensational mountain views and the most dramatic Himalayan passes, the Larkya La (5,213m). The area is of strong Tibetan influence with the trade routes between the regions which still prevails. Unlike many other regions, this valley is a sanctuary to many highly endangered animals. Conservation of wild life in the area has been achieved by monks of the monasteries in the area by putting a hunting ban in place. This action has helped the wildlife to prosper. The area is now an important habitat for the snow leopard, grey wolf, musk deer, blue sheep and the Himalayan Tahr. Permits. Entrance fee and all Taxes. Guide and 1 porter for 2 guests. The cost or the services not mentioned in what's included are not included in the price. Helicopter evacuation charges in case of emergency while trekking. Food during the stay in kathmandu. 3. Breathtaking Snowy White Peaks. 4. Lush Oak and Rhododenfron Forests. 5 Hiking to Tsergo Ri (5,033m) and Kyangjin Ri (4,770m). The spectacular living geology of the Langtang region that lies to the south of the Tibetan border, between the main Himalayan range to the north and a slightly lower range to the south.Langtang is one of the nearest trekking destinations from Kathmandu and is an unparalleled combination of natural beauty and cultural riches. Langtang lies about 130 km north of the Kathmandu Valley close to the border with Tibet, China. 1.The Pacific Asian Travel Association (PATA) conferred their Gold Award 2001 to Sirubari in recognition of the efforts being made to preserve traditional Nepali culture and heritage. 2. The first model tourism village of Nepal. 3. Pleasent weather through out the year. 4. Encounter village life with villagers. Traditional Cultural program (dancing and singing).